SCVHistory.com LW3250 | Film-Arts | 'Robin Hood: Men in Tights,' Sand Canyon, 1993. Publicity photo shows writer-director-producer-actor-songwriter Mel Brooks and cast on location at Sable Ranch/Rancho Maria for "Robin Hood: Men in Tights" (Twentieth Century Fox 1993), Brooks' parody of "Robin Hood: Prince of Thieves." Top photo by Robert Isenberg shows Brooks in his role as Rabbi Tuckman, purveyor of sacramental wine and snipper of ... cigars. 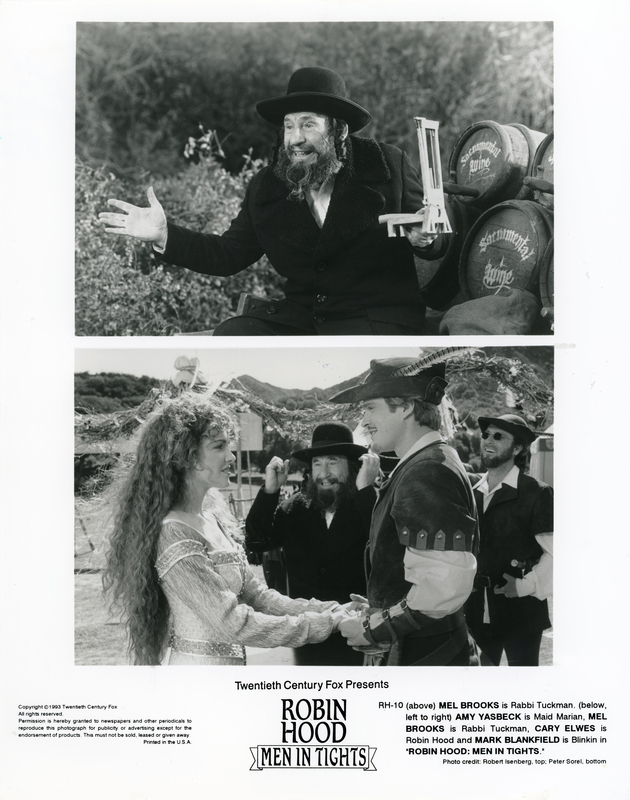 Bottom photo by Peter Sorel shows (from left) Amy Yasbeck as Maid Marian, Brooks, Carey Elwes as the title character, and Mark Blankfield as Blinkin. LW3250: 9600 dpi jpeg from original photograph purchased 2018 by Leon Worden.